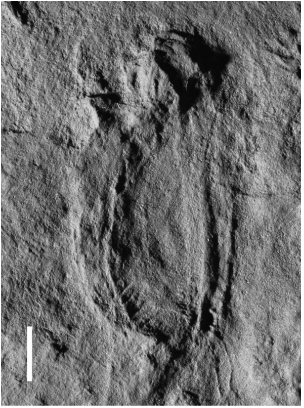 Kimberella quadrata is an important taxon in palaeontology. 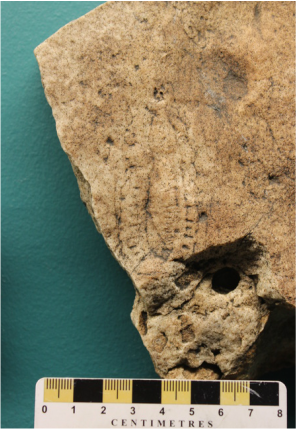 It has been widely considered to be the most reliable Ediacaran example of an early bilaterian animal, and has therefore been used as a calibration point in modern molecular clock studies (e.g. Benton et al., 2015). Upon its original discovery, Kimberella was interpreted as an ancient medusoid (jellyfish) (Glaessner & Wade, 1966; Wade, 1972; Jenkins, 1983), however recent analyses have seen Kimberella redescribed as a basal mollusc (e.g. sea snail; Fedonkin & Waggoner, 1997; Ivantsov, 2009; Gehling et al., 2014). ​Clusters of paired scour marks are often associated with Kimberella, and have been interpreted as scratch marks created by the organism grazing on the microbial substrate: a feeding strategy employed by living gastropods (e.g. snails and limpets). ​Jenkins, R.J.F., 1983. Interpreting the oldest fossil cnidarians. ​In Proceedings of the 4th International Symposium on Fossil Cnidaria. Paleontographica Americana ​54, 95-104. Kimberella quadrata, South Australian Museum specimen P49391. Scale bar = 1 cm. Modified from Coutts et al. (2016). ​Ovate bodies, rounded at one end and with a smooth contour; internal structures represented by several longitudinal, distinct zones of two kinds, coarsely segmented or with fine, transverse, frill-like grooves bordering a smooth area.